Penang, or Pulau Pinang as the locals call it, is a small island off the west coast of peninsular Malaysia. In ways it is similar to Toronto as it is highly diverse in ethnicity, culture, language, and religion – however it is different in that the sun shines here every day (average of 35C during our stay; consequently our deodorants ran overtime!). We chose to base ourselves in the highly popular district of Batu Ferringhi and rented a nice, 3-bedroom apartment at Eden Fairway Condominiums (www.penangguesthouse.com); mostly a hangout place for British and Dutch retirees (with whom I had lovely chats during my morning swims); a centrally located place with ample space and a lovely pool. 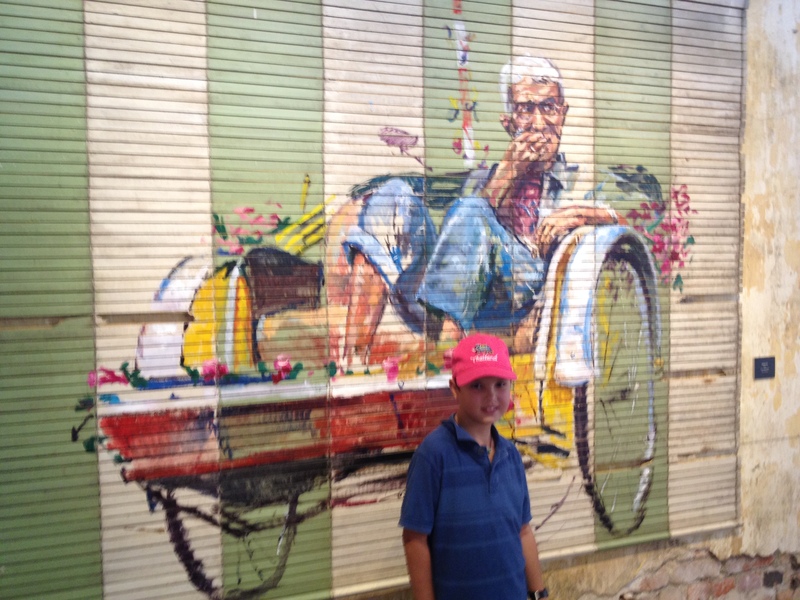 Our stay in Penang was focused on homeschooling, as well as taking in the unique, local culture & arts scene, enjoying the widely varied and delicious assortment of foods (Penang is dubbed the greatest street food capital of the world) and learning some new skills. 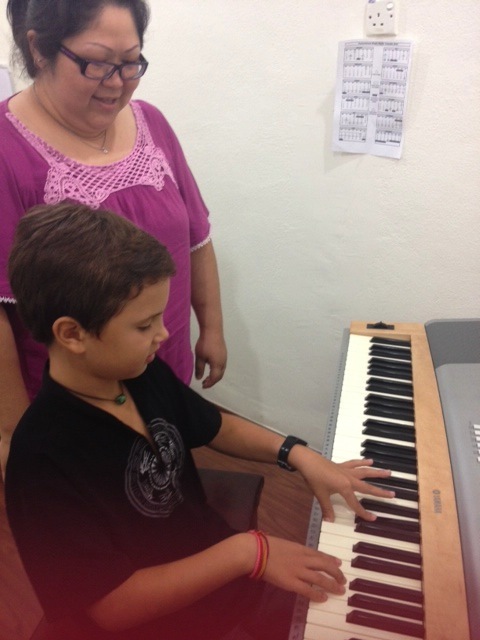 In Thailand, Emile and Filou started to get really excited about learning music (mostly after jumping on stage and giving an impromptu performance with Anthony at a local bar in Chiang Mai). 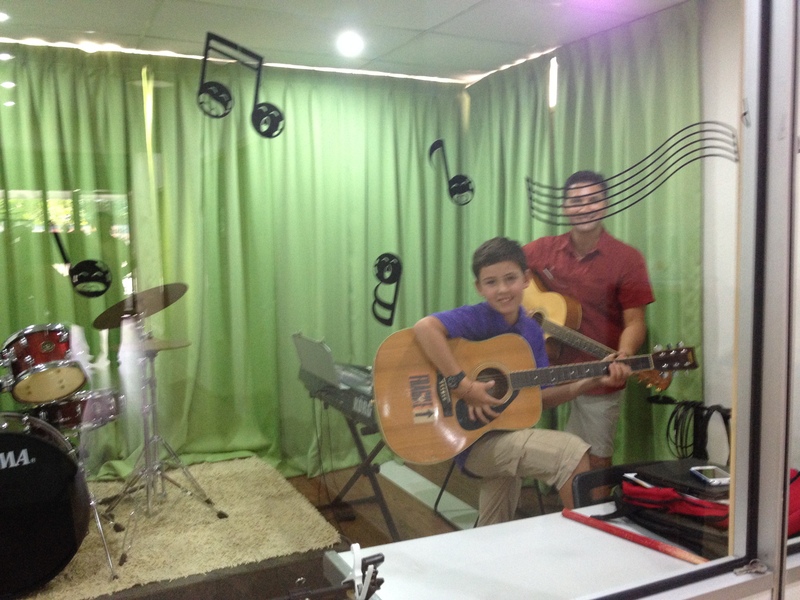 So to encourage their excitement for guitar (Emile) and piano (Filou), we signed them up for some music lessons and took them to Cornerstone Music Studio (https://www.facebook.com/CornerstoneMusicStudio). They loved it! Emile is now eyeing Papa’s new travelling guitar and both kids are dreaming about a boy-band! 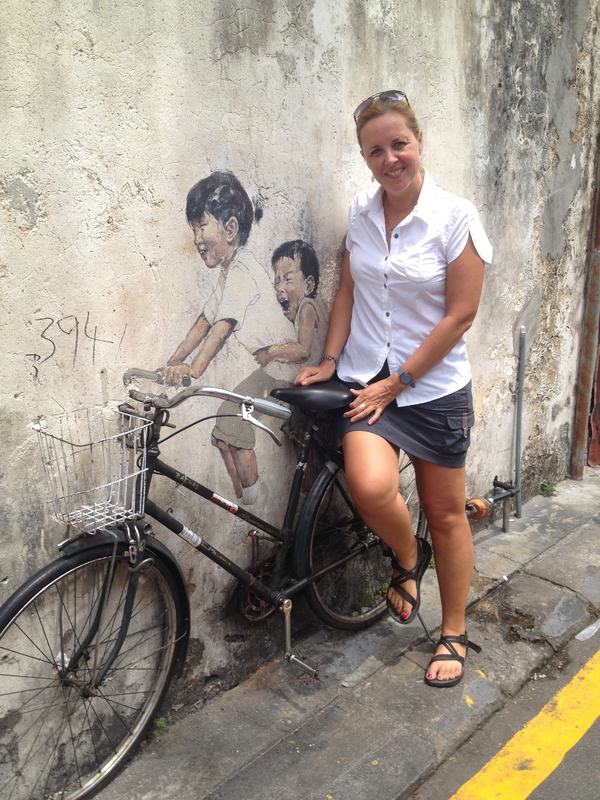 Also, what better way then to take in more arts and culture, then to visit nearby George Town. George Town is a UNESCO world heritage site as it is one of the most complete surviving historic cities on the Straits of Malacca, with a multi-cultural “living heritage” originating from the trade routes from Europe through the Middle East, the Indian subcontinent and the Malay Archipelago to China. The city reflects a mixture of influences that has created a unique architecture, culture and townscape. 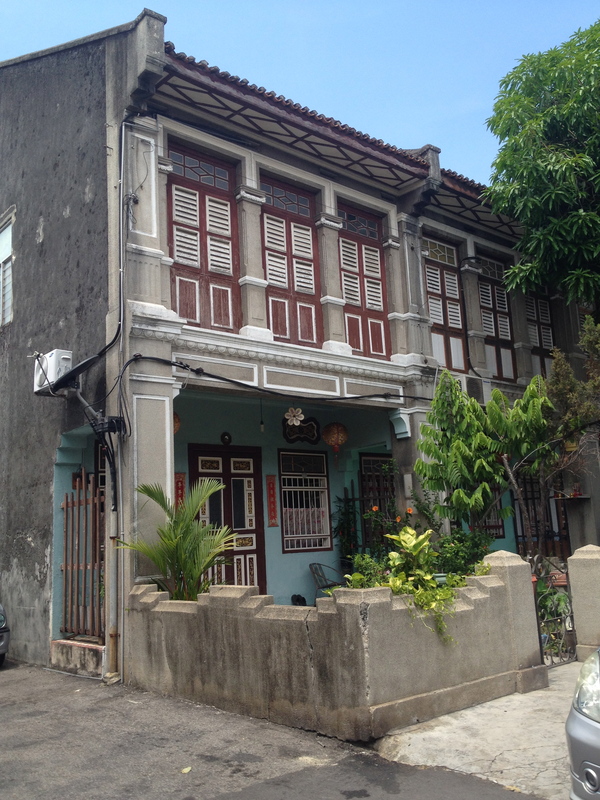 In particular, it has an exceptional range of colonial shop-houses and townhouses. George Town is also very well-know for its unique street art which is something that piqued our interest. 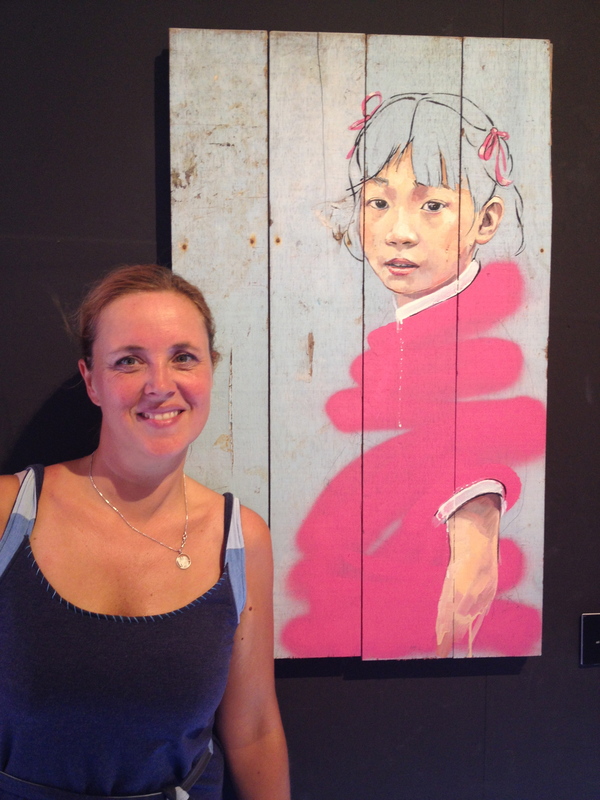 Anne, our landlord, pointed out that there was an art exhibition in town, by street artist Ernest Zacharevic. 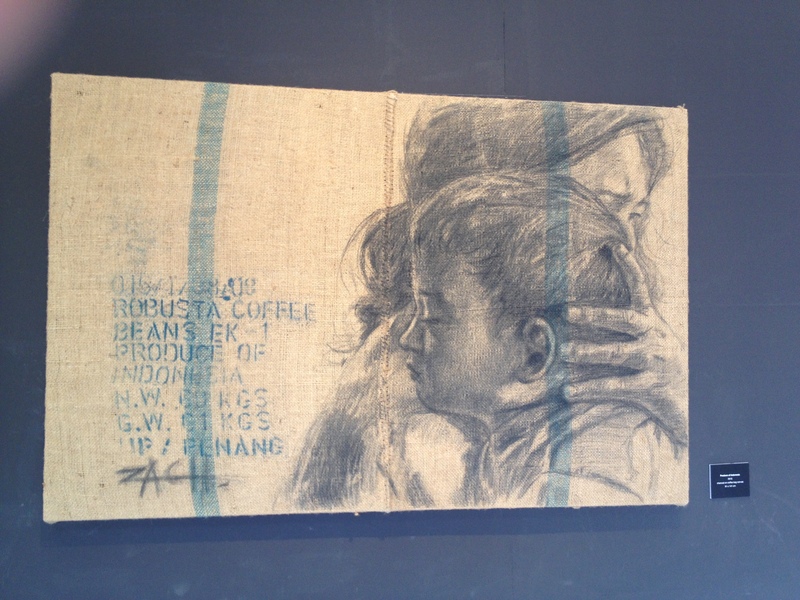 The“Art is Rubbish”, his first solo art display in Penang, was a wonderful open-air showing of some very unique art pieces. I have to admit that I’m pretty particular about the art I like; not many works please me easily. 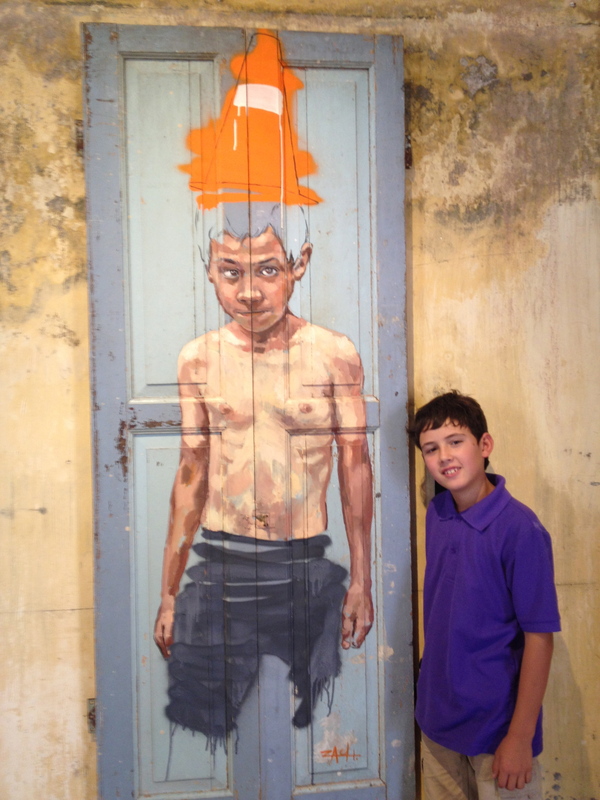 But these pieces were just incredible; not only does Ernest Zacharevic use very unique, sustainable media to paint on – old city walls, antique doors, used window blinds or coffee-bean sacks – he paints the most vivid facial expressions (the face of the little Asian girl was so real, it seemed to pop off the old wood it was painted on – just surreal)! There was frankly not one piece in his collection of 20 artworks that I didn’t want to bring home. Absolutely loved it! But alas, all the works had already been purchased. My favorite piece! The face of this little Asian girl was mesmerizing! 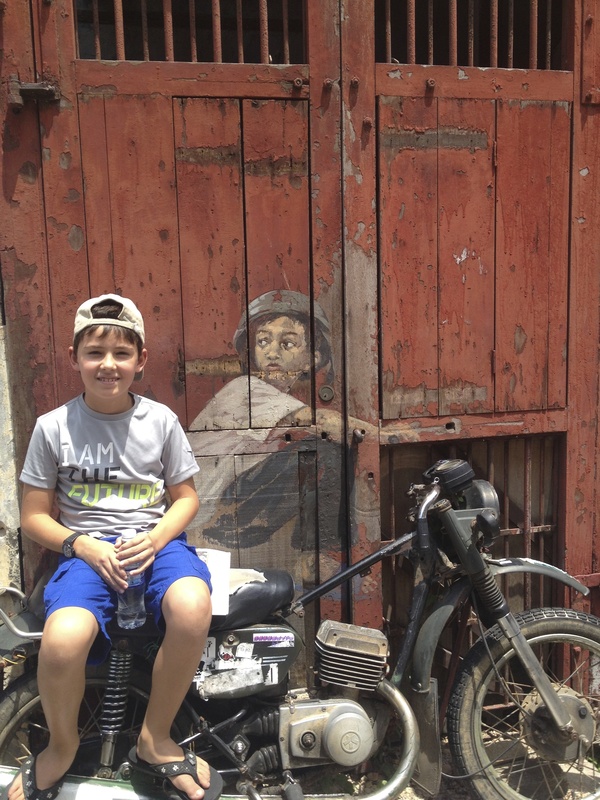 Now, we were inspired to see more art – so a few days later, we got two trishaw drivers to take us around town and show us the street art. We were happy to have taken this approach, versus walking around ourselves, as many of the pieces were hidden in small street alleys. 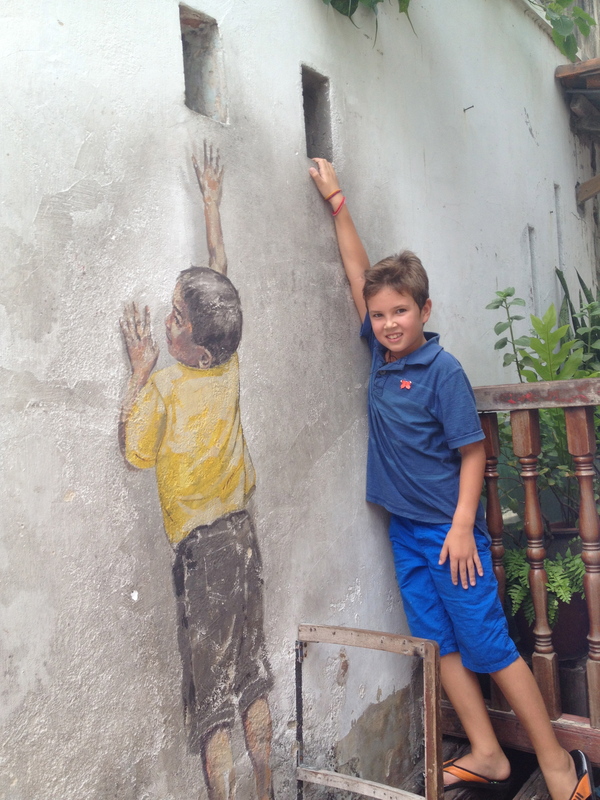 Ernest Zacharevic’s beautiful wall paintings of children, all across historical George Town, are funny, fascinating and open to interpretation…and the attention for his work is apparently building rapidly. 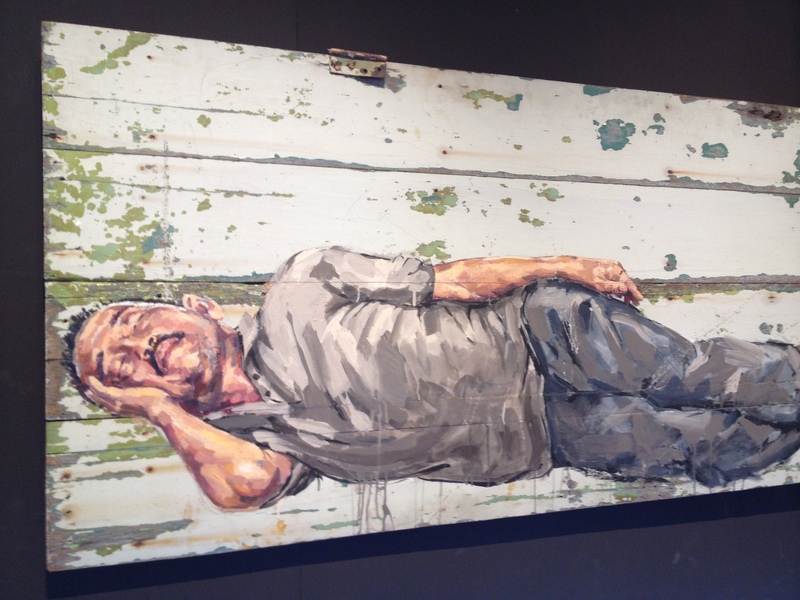 He painted his first series of murals for the George Town Festival in 2012. But what really started the art in the city, was when a Kuala Lumpur based art company won the Penang state art challenge ‘Marking George Town: An Idea Competition for a UNESCO World Heritage Site. 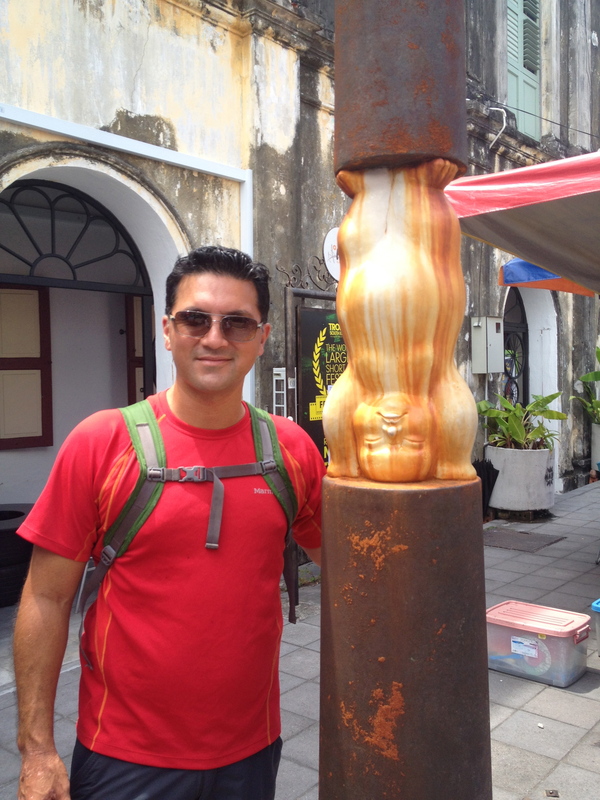 The company proposed to tell stories of Penang inspired by their residents and culture through 52 steel rod caricatures placed all over George Town. Together with the wall murals, they are now catching the world’s attention. 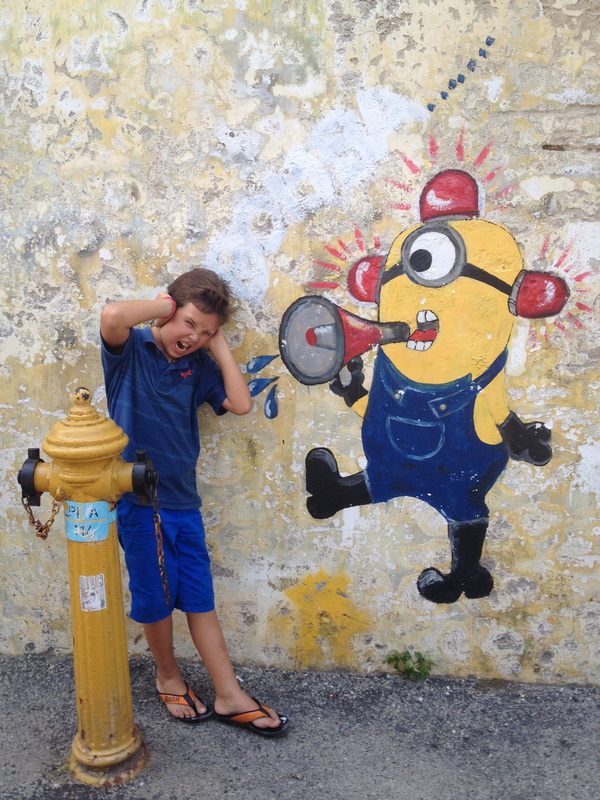 We were certainly happy to observe how the walls of George Town are gaining a new lease on life…with art that is not only beautiful and fun to watch, but that is is also helping to implement a brilliant city beautification strategy! 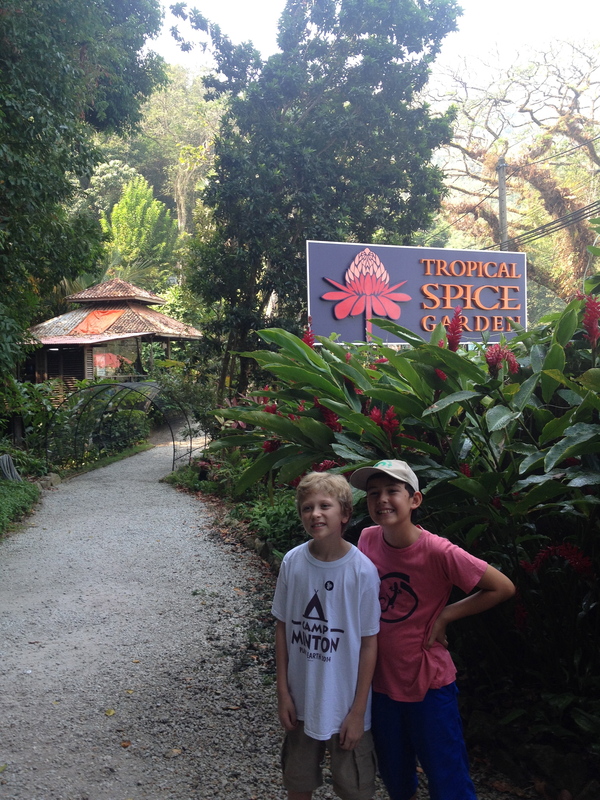 Situated in what was once an abandoned, rubber plantation on the north-west shore of Penang, the Tropical Spice Garden (http://tropicalspicegarden.com) was on our hit-list to visit as part of Emile’s homeschooling repertoire. This eco-attraction, tucked away within a natural valley fronting the Straits of Malacca, houses over 500 species of herb, spice and tropical plants. 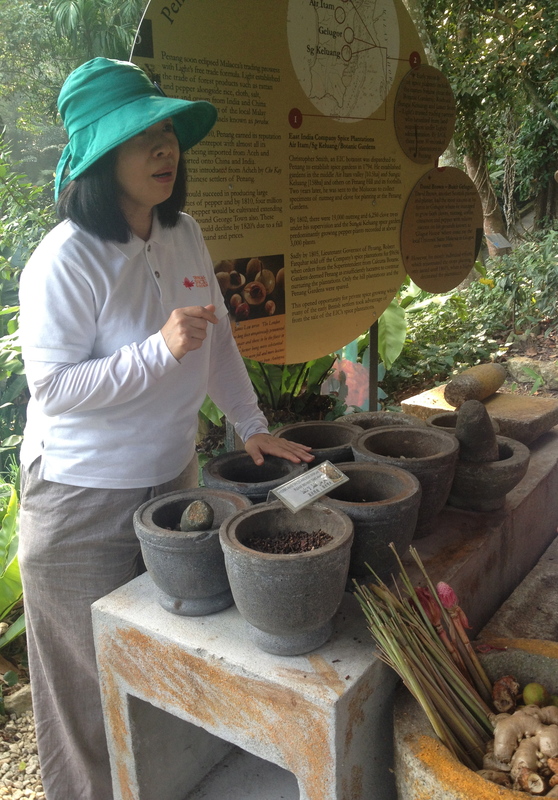 Together with our new friends Alana and Ian, we set out to learn about spices and were directed by our guide Tan Choon Eng (CE), towards the Spice & Ornamental Trail. We quickly gathered from CE that Malaysia boasts one of the richest collections of spices in the world due to its long trading history (spices were discovered and traded by the Dutch and British who planted the best of its varieties in Malaysia). Spices can be obtained from seeds, fruits, flowers, roots, bark etc. Turmeric is a type of ginger that has anti-bacterial and tumor fighting tendencies and is used both for cooking and religious ceremonies. In India, turmeric is used to stain the robes of monks, due to its rich orange colour! “When we cut away forests, we take away medical miracles”. 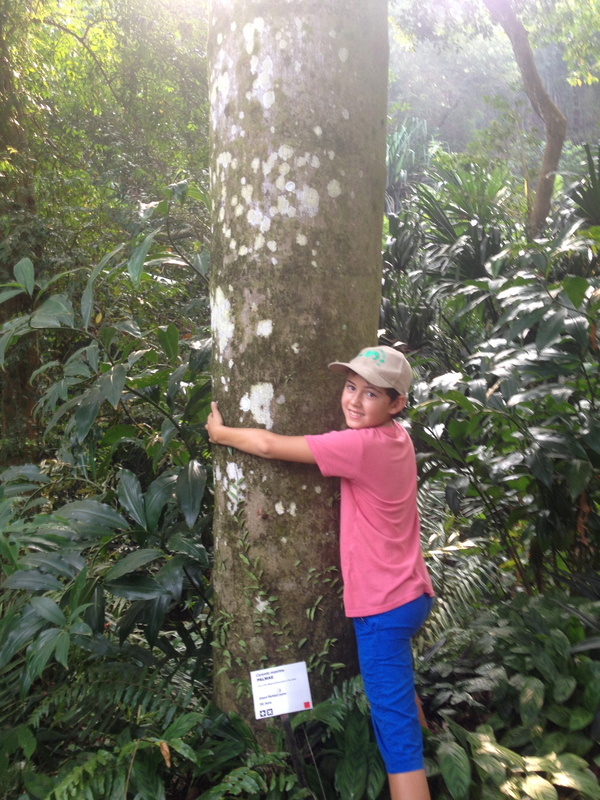 Emile’s conclusion: let’s hug our trees instead! It was all very interesting and educational and upon parting CE stressed that “when we cut away forests, we take away many medical miracles”. We, and I am sure our YiaYia, couldn’t agree more! With this important message and a cup of very fragrant and fruity “cooling tea” called Luo Han Guo, we were on our way…. 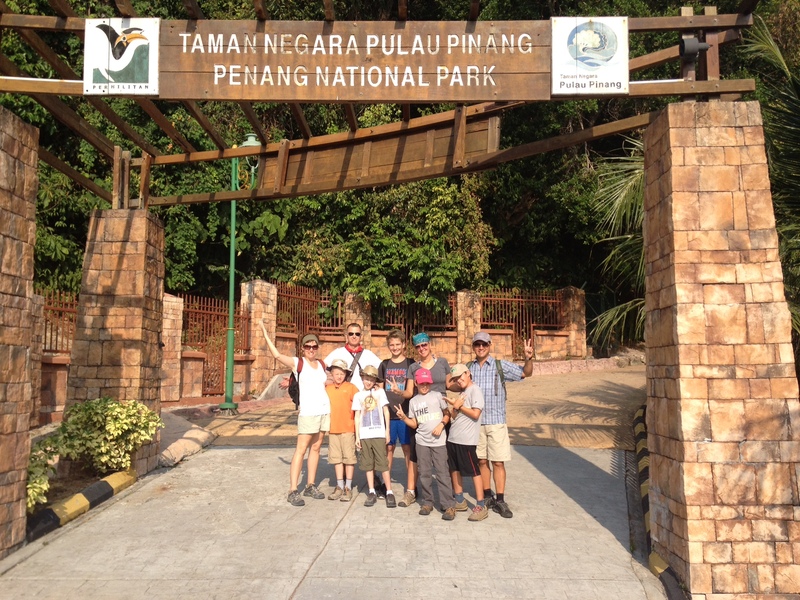 Penang National Park is the world’s smallest national park and one of the few natural forested areas left on the island. With 1181 hectares of forest and 1381 hectares of wetlands, the Park’s ecosystem is a diversity of habitats with hills, sandy and rocky beaches, streams and coastal forests – representing much of the local natural habitats. Together with our new friends from Texas, the Minton family, we set out to explore this natural wonder. 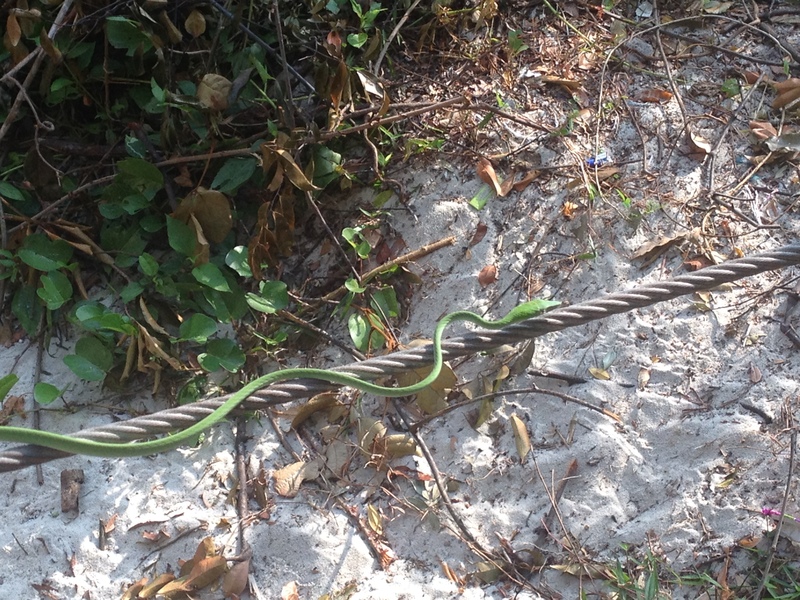 After a beautiful, fierce hike for about 2 hours through dense forest (during which we encountered some unique, long green snakes… to the delight of some and dismay of others), we reached Turtle Beach. The Penang Turtle Sanctuary is located on this beach, set up to help protect the dwindling populations of Green Sea and Olive Ridley turtles in Malaysian waters. These species of turtles come onto the beach at night to lay their eggs, which are then protected by the sanctuary from predators, until they hatch up to 60 days later. Emile was a little disappointed we only saw the baby turtles in a basin, and not in their natural habitat on the beach. 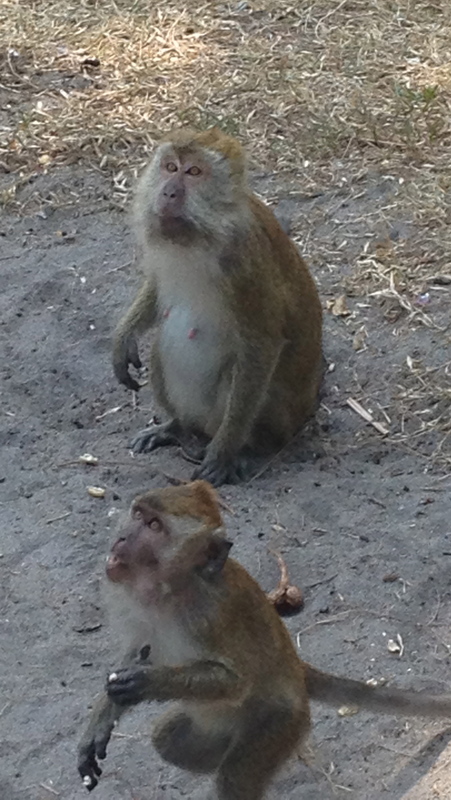 So, with a pre-arranged local boat, we moved on further to Monkey Beach. This beautiful, small isolated beach, certainly gave honour to its name, as we saw several Macaque monkeys around – jumping the trees. But after our Cambodia incident (where a monkey chased Filou), the kids are not so keen on them anymore – and had more fun swinging on tree ropes. All in all, a fun and active day! With the incredible quantity of amazing hawker food stalls, Penang is a dream come true for those who love to eat; such as the Watanabe-Swagemakers family! The many different food cultures and traditions spanning from Chinese, Indian, Malay, Mamak and Nyonya cuisines make for a very unique eating experience. We tasted such diverse and rich flavours in every dish: just out of this world! Eating is always more fun with others and Penang seemed to be the perfect place for get-togethers – as it is a very popular stop-over for travelling families. 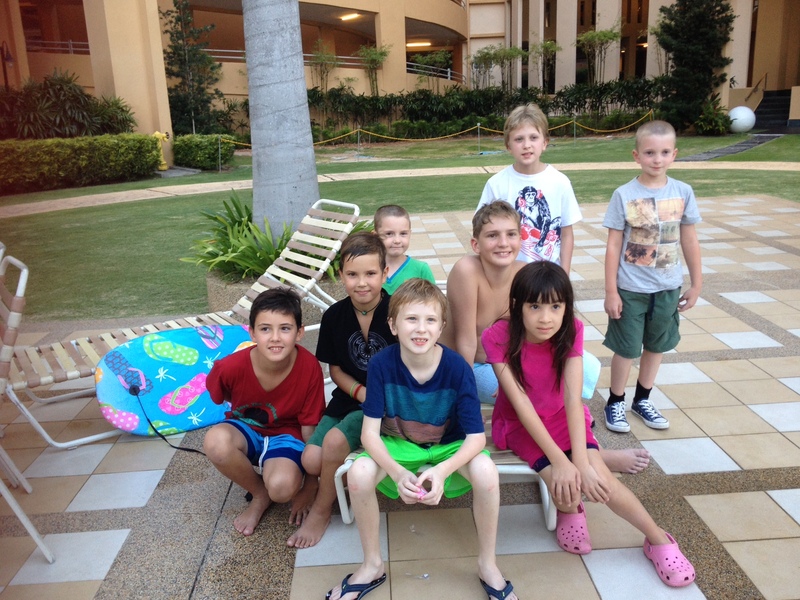 We loved meeting up with 5 of them – from the US, Australia and England – and had a few great meals together. 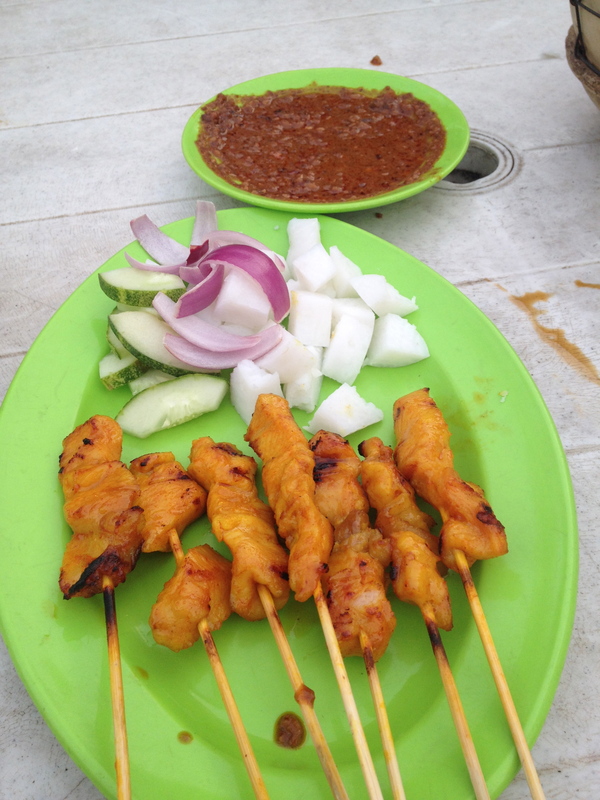 Our most favorite hang-out: the “Long Beach” hawker stalls! We seem to share a unique bond with these travelling families; people we have never met before but instantly click with. They share our deep passion for travel, for wanting to give our children a “world education”. They gladly share their best travel tips & stories as well as the ups and the downs of being long-term on the road. So from commiserating over homeschooling difficulties to sharing the many wonderful ways in which our children are developing and learning on the road… we discuss it all and agree full-heartedly that travel is the very best thing…a priceless adventure that we are thankful for every day! So thank you Malaysia, for have given us a great social and learning time …we have enjoyed your wonderful culture and arts scene, our bellies are full and we’ve soaked up enough of your hot hot sun….now it’s onto New Zealand!